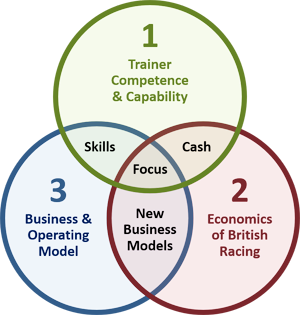 Over the last three blogs I’ve been arguing that there is a major problem with the economic viability of the training profession in this country, and it should be a strategic aim of British Racing to acknowledge and address it. Indeed the problem isn’t just in the UK, and I read an article last week about the position in Ireland which was described as “perilous”, with the author advocating considerable changes to the internal economy of the sport. It argued that the problem at the grassroots trainer level is the equivalent of the “squeezed middle” in the wider economy, and I wouldn’t disagree with that. Finally, to illustrate this, I noted that Martin Hill had his last runner recently, Scorpion Star, at Newton Abbot before announcing that he was throwing in the towel. In my first blog on this subject I put trainers into one of three tiers, and without any doubt it is the small and medium-sized who are really struggling to survive. Without being melodramatic, it could be that a contraction in the training ranks might soon be staring the BHA in the face, particularly if there are any wider economic crises, Brexit negotiations collapse or a Labour government of Corbynistas comes into power. Imagine the economic shock if the VAT concession to owners were scrapped. However, rather than just concentrating on the potential crisis it is more helpful to brainstorm potential solutions, while recognising that there are many interdependencies between them and there is no magic wand or miraculous medicine. I’ve grouped the ideas around three broad themes. Identify the extent of the problem. The BHA and the National Trainers’ Federation should organise an assessment of the trainer ranks. Identify the problems, their impact and the inadequacies. Change trainer attitudes and mind-sets. As a group they are very hard to help, and extremely conservative by nature. Competition rather than collaboration rules the day. That needs to change. Focus on business models and business skills. Most trainers score highly on training skills and abysmally on business skills. Explicit business plans for success are noticeable by their absence. Revamp the training of trainers. The training curriculum is old-fashioned and overly focused on knowledge and regulatory requirements. It needs to become much more experiential. Design an improvement programme. Despite the inevitable apathy and cynicism there is a major need for across-the-range improvement in trainer skills and behaviour. That requires coaching. Produce toolkits and apps. Rather than expect trainers to go to classrooms, the teachers need to go to the trainers. The NTF should put together a series of user-friendly apps and toolkits. Challenge the closed system. There are 500-700 trainers in the UK, with the vast majority of them having been in the industry since teenage days. They have had little exposure to anything else. Illustrate benchmarks and best practice. Every trainer seems to have a naïve belief that they are doing everything right. Arrogance and stupidity is a pretty deadly combination. Challenge it. Attract more owners. Trainers are the gate-keepers to the industry, from an ownership perspective. They need a lot more help to adopt modern marketing, promotional and communication techniques. Tune in to owner expertise. Many trainers wouldn’t have a clue about the business skills of their owners. Major owners are potential benefactors to trainers, who need to tune in to that network. Define the business plan. Doing well, winning more races and surviving financially is not a plan. Trainers need to understand the different elements of successful operating models, and adopt them. Grow the revenue. Often easier said than done, particularly with insultingly low levels of prize-money. Having said that, how many trainers have an explicit plan to improve financial return on assets? Reduce the cost base. As an example, the Thoroughbred Breeders’ Association has a collective purchasing scheme. How many trainers participate in it? Less than 10%? Says everything. Address over-concentration at the top. The elite tier of owners, trainers and breeders are taking a disproportionate amount out of the sport. In effect they are being supported by the lower tiers. Spread the wealth. The owners, trainers and breeders of top horses already benefit hugely from downstream breeding. They are appropriating far too much money from the sport. Cap the prize-money for Group and Graded races. Redirect it into lesser racing. Redistribute prize-money and reduce certain types of race. Again, there are far too many races at Listed level on the Flat, or beginners’ / novice chases, that have small fields and are milked by Tier 1 trainers. Reduce them and have a substantial increase in claiming type races, rather than handicaps. Restrict the number of runners in the same ownership. No trainer or owner should be allowed to have more than two horses in any race. The top tier are manipulating races through their competitive and numerical strength. Develop a race series for the middle market. Help the smaller trainers by introducing a series of races confined to trainers with, say, fewer than 50 horses. Copy the French model on handicaps. The vast majority of grassroots trainers are winning primarily at handicap level. Richard Hughes has argued wisely that increases in handicap ratings should only apply to the winner. Adopt the French system. Put the winner up in the weights and reduce all the other horses. Copy the French model on placed prize-money. Again in France, the second-place money is half that of the winner. In England it is usually far less than that. The trickle down of total prize-money percentages to trainers is a lifeline, and this would be a big financial contribution. That’s as far as I need to go, I think! I’ve brainstormed twenty ideas. Doubtless some of them will be seen as totally impractical and / or will disturb the cosy cronyism at the top of the sport. A working party of trainers, I’m sure, would come up with far more. Hopefully this series of blogs has hit home and it would be marvellous if there could be a positive response through the design of a change programme that would really help the majority of British trainers.